You may know of the BC Government’s plan to export Liquefied Natural Gas (LNG) from our province. Premier Christy Clark would like the first LNG processing and export plant to be operational right here in Howe Sound by March 2017. 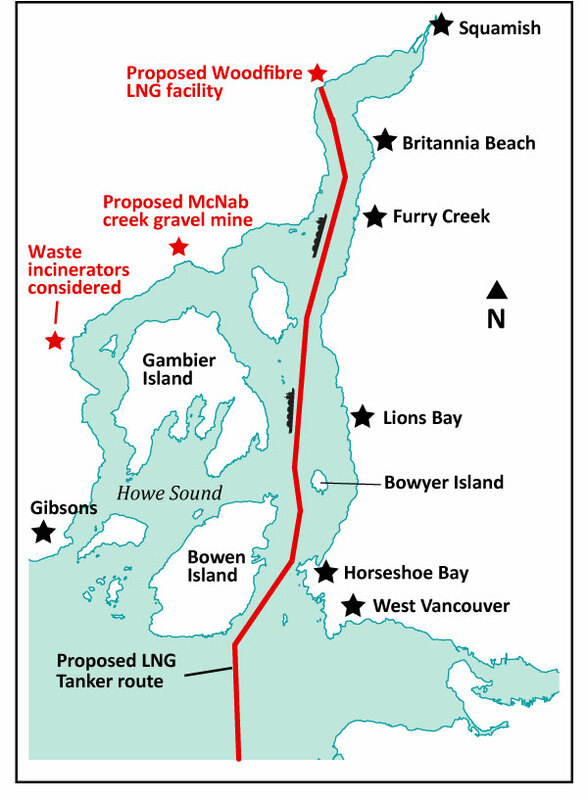 The parallel-proposal to this project, the twinning of the Eagle Mountain Woodfibre natural gas pipeline would make expansion possible over time and would lead to 30 LNG supertanker trips per month each way, going up and down Átl’ḵa7tsem / Howe Sound. A large scale gravel mine with a pit of 77 hectares proposed by BurnCo for McNab creek. A side from the destruction of this beautiful area which would be seen from miles around, the noise and dust pollution and vibrations caused by the extraction and crushing would interfere with marine life. Twenty species at risk are identified to be impacted by this proposal. Increase in marine traffic due to gravel barges. PROJECT CANCELLED – Garbage waste incinerators for Metro Vancouver. The Port Mellon site is eyed as one of the possible sites to build incinerators to curb the waste of Metro Vancouver from going the landfill. The capacity would be to burn 370,000 tons per year. Serious concerns about Howe Sounds air-shed if this site were to be chosen and an increase in marine traffic due to barges carrying Metro Vancouver waste to the site.– PROJECT CANCELLED! The environmental degradation was caused by the Britannia Copper Mine which operated from 1900 to 1974, the Nexen Chlor-Alkali chemical plant at Squamish(1965-1991) and the paper and pulp mills at Port Mellon(in operation) and Woodfibre (closed 2006). The fisheries were closed (and are still closed for a number of species) and the effects of heavy metal pollution have been felt for a long time. It took a community effort to finally plug and filter the contaminated run-off from the Britannia mine. A large-scale treatment plant became operational in 2006. The clean up of the heavily contaminated Nexen site was finished in 2006. Port Mellon and Woodfibre cleaned up their operations and Woodfibre closed in 2006, leaving a contaminated site as legacy.